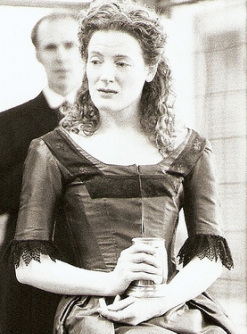 Norah Long as Miss Julie in Strindberg’s drama. Who: By August Strindberg. Directed by Peter Rothstein for the Ten Thousand Things Theater Company. Review capsule: Norah Long is luminous as the title character, descending into the horror of her own wish come true in this period exploration of social and sexual stratification. Illicit affairs generally require time to ferment before they blow up badly. Not so in the hothouse world of August Strindberg’s “Miss Julie,” a taut melodrama whose spirit of madness roars through social and sexual privilege in 19th-century Stockholm. One brief romp with her father’s valet plunges the brittle Julie into a frenzied maelstrom out of which she is unable to pull herself. The severity of her crisis dates the cultural conventions of this occasionally talky piece, being staged by the Ten Thousand Things Theater Company. But director Peter Rothstein – with composer George Maurer’s keyboard reinforcing mood and Kathleen Richert’s costumes articulating relationship – wisely concentrates on the crackling tension among three characters caught in this lust-driven conundrum. Strindberg’s language is spare and direct, the metaphors clear yet poetic as they demonstrate character and idea. Occasionally he overplays that transparency, such as when Julie tells her dream of wanting to fall from a pillar, and Jean replies that his dream is to climb up from a tree. Norah Long is simply beautiful to behold as Julie – haughty, confident in her assumption of privilege as she makes Jean her plaything. Her comfort in the skin of hauteur, though, doesn’t prevent her from shading this character who rages through the emotional palette. When Jean suggests in a cavalier moment that the servants “take your food, but they don’t love you,” Long flashes an honest and instant moment of hurt surprise – held back only by her dignity. Only a moment, it nonetheless speaks volumes about her instinctive ability. Terry Hempleman suffers in comparison as he roams through the psyche of Jean’s presumptuous ego. Whether it is Rothstein’s direction or Hempleman’s natural warmness, the actor doesn’t quite feast on the breathtaking cruelty that Strindberg makes available. He is more comfortable with the supercilious attitude that Jean adopts to ameliorate his social standing. In a much smaller role, Carla Noack invests Christine with severe, Hard suspicion and hypocritical righteousness in her conception of God’s grace.